This classic 1950s sport jacket was coveted by all fashion-conscious Americans of the time. The traditional model featured a wool body with leather sleeves, but it looks just as great in sandwashed silk, corduroy, or ethnic print cotton. 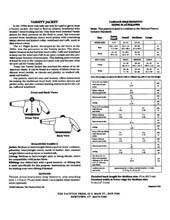 Pattern includes instructions for optional hand-knitted ribbing for cuffs, collar, and waistband. Misses and Men's XS, S, M, L.